KNOXVILLE -- What was intended to be a simple video e-mail message to the University of Tennessee turned into cut-down comedy hour. UT senior basketball players Wayne Chism, Bobby Maze and J.P. Prince were asked merely to speak into the camera, thank students for their support this season and encourage them to attend senior night festivities before tonight's game against Arkansas. Part of the senior night promotion includes free headbands to students, many of whom plan to wear them awkwardly high atop their heads in a tribute to Chism's self-described "yarmulke." But the cameraman made a mistake. He didn't give the players a script. "Come get your free headband," Chism said. "We're all going to wear one." "Umm ... I'm not," Prince interrupted. "You couldn't pay me to wear one." "Just because your head's too big," Maze responded. "We'd need a slingshot to get one on your big ol' head." "My head's smaller than either of your nostrils," Prince shot back. "Your nasal strip would be bigger than my headband. When you sneeze, everyone in this arena gets wet." Without blinking, Maze then wondered aloud whether students should get Prince's acne medication to go along with their Chism headbands. Not to be outdone, Chism simply offered, "Y'all both ugly." A normal video wouldn't have seemed appropriate, given the circuitous routes UT's seniors have taken to arrive at this point. Chism, a four-star prospect and Pearl's first high-profile recruiting commitment to the Vols, is the only man left from the star-studded 2007 signing class. Tyler Smith, a Tennessee native who transferred to UT and became an All-Southeastern Conference forward and team captain, was on track to be honored tonight before getting dismissed from the program in January. "I don't even know how to answer that question right now," Chism said regarding the losses of Smith and former classmates Duke Crews, Ramar Smith, Josh Tabb and Marques Johnson. "It's crazy, though. I mean, I came in with a lot of people, and through the times we've been here a lot of people have came and gone. Being the one left on senior night is kind of disappointing, but I know the guys are out there doing something better with their lives. "They're still my brothers, and I still love and care about them." Some left Chism's class, but others arrived, too. Prince -- also a Tennessean -- transferred to UT in time to play three mostly successful seasons for the Vols. Maze, a former Baltimore-area high school star, arrived last year after two seasons at Oklahoma and Hutchinson (Kan.) Community College. "Everybody's got a story, but all that matters is that we came to Tennessee, we became a family and we won a lot of big basketball games," Maze said. "And those of us still here are going to leave with our heads held high." Prince and Chism said they'd rather focus on Arkansas than get too caught up in senior night emotions. "It's my last time playing here, but I don't want to make more out of it than it is right now," Prince said. "I've had some great times here, and we've won a lot of games in front of a lot of a great fans, and I'm going to miss it one day. But stuff like that won't hit me until years from now. "I don't want to think about it too much right now, but you just want to leave the place better than when you came here, and I think we've done a good job of that. I'm proud of what we've done." Chism opened up a little bit more than Prince. "I kind of thought about it yesterday," Chism said. "I was like, 'Yeah, I'm just about to play my last home game.' It came pretty fast, so I was like, 'Wow.' But not excited." After a slight nudge, the quirky big man said he's already seen the fruits of his UT labor. 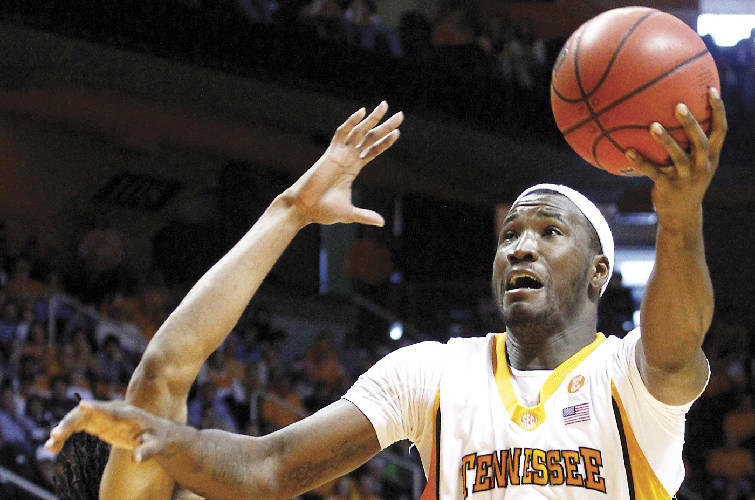 "When you look back, you'd see all the orange seats were kind of empty back then, and you'd only see some people there at the games," said Chism, who has played more games than any Vol in history and is on track to graduate in May with a double major. "It was like, is it a D-II school or what? It's supposed to be a D-I school, it turned around when Coach Pearl got here -- and our first signees for him -- and then a lot of things changed from there. That gym became packed every game. Every game started being sold out because of the way Coach Pearl has turned this team around, and he's still doing it. "I'm very proud. Back when I was in high school, people always said, 'Man, you shouldn't go to Tennessee.' Now when I go back home, everybody's a Tennessee fan." Maze was the most openly emotional of the trio. That's not surprising, considering the point guard came to UT with a less-than-stellar reputation off the floor but is on pace to leave in May as a two-year starter who graduated and made the honor roll with a 3.5 senior-year GPA. "This place means everything to me," Maze said. "Tennessee gave me a chance to change my identity and what people thought about me. When I was at Oklahoma, I was young and immature and got into a little bit of trouble and made some bad decisions. But since I've been here, there's been a total change. I haven't been in any off-the-court issues. I haven't been in any trouble. I'm going to graduate. I've changed my whole life around. "I think of my two years here as a blessing; a changing point in life, a transition from a boy into a man. I will remember that my whole life." But tonight ends the seniors' home careers only. They potentially have several more weeks to play. "Hopefully we can earn a big banner for this place, too."